India has a massive coastline & some of the best locations to learn Kayaking in the world! The eastern coast of India has pristine blue waters & is dotted with harbouring islands. You might have heard that kayaking requires a lot of strength and is very difficult to learn but that is not be entirely true. It is easy and anyone who is fond of it can become an excellent kayaker. 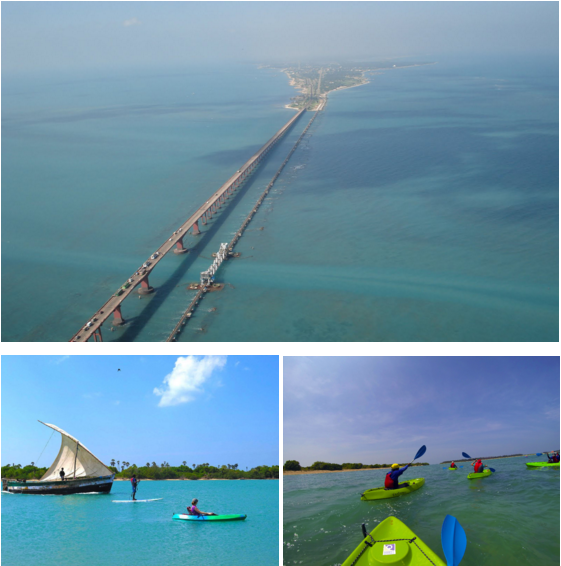 Our kayak school is located in the state of Tamil Nadu on the southeast coast of India. The channel between India & Sri Lanka is dotted with islands, lagoons & surf spots. We have absolutely flat water conditions every day in our summer season April to September on the North coast of the island & in our winter season December to March on the South coast of the island. If you want to give Kayaking a try but are unsure about committing to a full course. We will give you a brief orientation about the sport, the equipment used, water conditions and take you out for a kayaking trip along the beautiful coastline. Includes Kayaking equipment rentals, safety gear, beach transfers from school & Instructor fee. Learn the basics of Kayaking with an experienced instructor. Basic strokes, rescue techniques & trip planning. The course includes a 5km kayak trip. Includes Kayaking equipment rentals, safety gear, beach transfers from School & Instructor fee. Course is spread over two days. Accommodation extra. We have two of our own properties which were created just for water sports enthusiasts, large open areas, repair tank, washing, drying & storage for equipment with easy access to kayak spots.